Dascylium, Achaemenid satrapy in northwestern Anatolia (Herodotus, 3.120.2; cf. Thucydides 1.129.1: tê`n Daskulitìn satrapeían; OPers. tayaiy drayahyâ; DB 1.15; Kent, Old Persian, p. 117), part of the Persian empire until the 330s B.C.E. The borders varied, extending as far south as the Mysian plain and the southern Troad and east into the land of the Bithynian peoples; some satraps controlled both sides of the Hellespont. The territory of Dascylium encompassed estates, garrisoned fortresses, and cities and villages in which Persians and other groups were mingled. The name Dascylium was also applied to a number of sites within the satrapy, the most important being the satrapal estate located at modern Hisartepe on the southwestern shore of Lake Manyas, near the village of Ergili. The relations of Dascylium with the Greeks and Persians are better documented than those of inner Anatolia, though most written sources are accounts by hostile outsiders. Archeological evidence consists principally of administrative documents and monumental remains. The former are bullae with impressions of stamp and cylinder seals (q.v.) from the Dascylium estate (Balkan), the latter carved funerary stelae and traces of platform tombs (Akurgal; Bakér; Mellink, 1990-92; see Sekunda, p. 196 map). On the stelae funerary processions, banquets, and horsemanship are depicted in relief (see, e.g., EIr. V, p. 734 fig. 58); they are paralleled elsewhere in Achaemenid Anatolia (see CAPPADOCIA; CILICIA). The inscriptions on some of these monumental remains suggest a local administration composed of several ethnic groups. The highest dignitary was the satrap, usually a member of the extended Achaemenid family, who resided on the Dascylium estate. 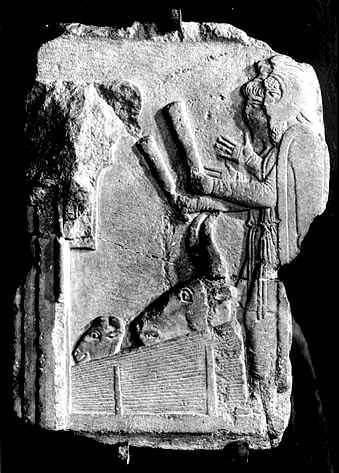 The structure of his court duplicated that of the Achaemenid great king at Susa. The subordinate officials were a mixed group: those who lived on estates of their own, both Persians and Greeks tied to the satrapal court, and such indigenous political authorities as tribal leaders and city governors. All these categories overlapped. Individual officers are mentioned only sporadically in the sources, and it is difficult to reconstruct the hierarchy among them. The satrap was expected to maintain order and thus to ensure a favorable climate for economic activities that would generate tribute (cf. Thucydides, 8.5-6). Dascylium was rich in natural resources, particularly timber, which appears to have been under satrapal control (cf. Xenophon, Hellenica 1.1.25; Theophrastus, Historia Plantarum 4.5.5; Strabo, 12.572, 12.574-75). There was also gold, but no regular coinage was issued (Pliny, Naturalis Historia 37.193; Strabo, 13.591, 14.680; Herodotus, 3.90). In local areas the satrap’s responsibilities were delegated to lesser officials (e.g., the Greeks Zenis and Manis; Xenophon, Hellenica 3.1). The fulcrum of Achaemenid control and expansion was the estate system. The satrapal estate itself yielded sufficient revenue to support a luxurious style of life (Xenophon, Anabasis 4.4.21, 7.8.8 ff. ; idem, Hellenica 4.1.15-17, 4.1.24, 4.1.33; cf. 3.4.13; Hellenica Oxyrhynchia 21). There were a manor house, some fortifications, barracks and stables (implied by Xenophon, Hellenica 3.4.13, 4.1.25), and some sort of construction for use by visiting royalty from Susa (Plutarch, Agesilaus 11.3; Arrian, Anabasis 1.17.2; Hellenica Oxyrhynchia 21; cf. Xenophon, Anabasis 1.2.7-9). Judging from the style of surviving funerary monuments, the manor house would have reflected a reworking of Persian and indigenous styles. Before the Achaemenid conquest, in the 540s B.C.E., Dascylium was part of the Lydian kingdom; Greek authors reported traditions associating the name Daskylos or Daskyleion with Lydian royalty (Herodotus, 1.8.1; Nicolaus of Damascus, in Jacoby, Fragmente 90, frag. 63; cf. frags. 26, 46, 47). Cyrus II (q.v. ; 559-29 B.C.E.) incorporated the province into the Achaemenid empire in 546. The earliest administrative data on Achaemenid Dascylium are from the time of Cambyses II (q.v. ; 529-22 B.C.E. ): According to Herodotus (3.120-28), Mitrobates governed the satrapy (nomos) in Dascylium but was killed by Oroetes, satrap of Sparda (Sardis), probably in the 520s. Under Darius I (q.v. ; 522-486 B.C.E.) and Xerxes I (486-65 B.C.E.) the house of Megabazus seems to have controlled the satrapy (Table 1) and to have furnished personnel for posts in Europe and Asia. Members of the family participated in the war with the European Scythians (ca. 514), and after the victory Darius seems to have left his military forces in the command of Megabazus, who subdued Thrace and Macedonia and subsequently became a senior commander in Xerxes’ fleet (Herodotus, 4.143-44, 5.1 ff., 7.97; Justin, 7.3). Megabazus was accompanied on his Balkan campaign by one son, Bubares, who married into Macedonian royalty and supervised the construction of Xerxes’ canal south of Macedonia (ca. 483); part of his family remained in Macedonia until the Greek defeat of the Persians in the 470s (Herodotus, 8.136, 5.21, 7.22). A second son, Oebares, was satrap of Dascylium in the 490s (Herodotus, 6.33). Megabates, a younger son of Megabazus, was Achaemenid commander of the fleet that sailed against Naxos in 500/499 and satrap at Dascylium in the early 470s (Thucydides, 1.129; Herodotus, 5.32-35, 6.32). With the Persian withdrawal from Europe, however, the house of Megabazus passed into obscurity, at least for the Greeks; information about Dascylium also becomes scantier once Herodotus’ narrative breaks off. In the later 470s Artabazus (q.v. ), son of Pharnaces (Par-na-ka; Hallock, p. 741) and a cousin of Darius I, succeeded Megabazus as satrap of Dascylium (Thucydides, 1.129). The first fifty years of his family’s rule is shrouded in obscurity (Table 2). Artabazus commanded the Parthians and Chorasmians in Xerxes’ eastern border war (480-79) and was in the Hellespont region in 470 (Herodotus, 7.66, 8.126-29). His social status and military competence account for his appointment to the frontier province of Dascylium at a time when Achaemenid Europe was in collapse. The length and events of his tenure are unknown, but he must have had to devote himself to policing the borders. In the late 460s he commanded troops in Achaemenid campaigns against Egyptian and Cypriote rebels (Diodorus, 11.74.6, 11.77.1-4, 12.3-4), and he probably left the affairs of Dascylium in the hands of his son Pharnabazus, for in the 430s Pharnaces, son of Pharnabazus, was satrap; Pharnaces remained active through the 420s (Thucydides, 2.67, 5.1). Pharnaces’ son Pharnabazus ruled Dascylium from at least as early as 413 until 388/7 B.C.E. (Thucydides, 8.108; Table 3). His activities are relatively well documented, as most of them touched on Greek affairs in the Aegean. In fact, he was one of the few Achaemenid nobles to find a place in Greek popular imagination (Athenaeus, 13.570c). From this more abundant documentation it is possible to see how deeply rooted in the political landscape of Dascylium (known to the Greeks as Hellespontine Phrygia) the descendants of the first Pharnaces had become (Thucydides, 8.58.1). Pharnabazus was occupied in warding off external and internal threats to his domain. With royal permission he assembled a fleet under his own command and defeated the Spartans, thus setting the stage for imposition of the “king’s peace” upon the Greeks in 387 B.C.E.). Within the satrapy a short-lived rebellion was led by the lesser officer Spithridates (Hellenica Oxyrhynchia 21-22; Xenophon, Hellenica 3.4.10, 4.1; cf. Weiskopf, 1989). After 388/7 Pharnabazus seems to have divided his time among Susa, Dascylium, and other parts of the Near East, where he twice commanded forces sent to pacify Egyptian rebels (Isocrates, 4.140; Diodorus, 15.29 ff. ; Nepos, Datames 3; Plutarch, Artoxerxes 24). He married several times; Ariobarzanes, probably his son by an unknown wife, was satrap of Dascylium from about 388 to 363 (Xenophon, Hellenica 1.4.7, 5.1.28). A younger son, by his wife Parapita, accompanied Pharnabazus on campaign in 395 B.C.E. (Xenophon, Hellenica 4.1.39-40; Plutarch, Agesilaus 13). In about 388/7 Pharnabazus married Apamâ (q.v. ), daughter of Artaxerxes II (q.v. ; 405-359 B.C.E. ), and their son Artabazus (q.v. 2) was satrap of Dascylium in the 360s and 350s (Plutarch, Artoxerxes 27; Xenophon, Agesilaus 3.3; idem, Hellenica 5.1.28; Plutarch, Alexander 21). Two other sons, Oxythras and Dibictus, were also resident in the satrapy in the 350s (Polyaenus, 7.33). Pharnabazus’ uncle Susamithras and his brother Bagaeus were mentioned in connection with military campaigns (Plutarch, Alcibiades 39; Xenophon, Hellenica 3.4.13). Ariobarzanes carried on his predecessor’s work and built upon his successes. He extended the territory under his control and intervened in Greek affairs (368; Xenophon, Hellenica 7.1.27 ff. ; Demosthenes, 23.141, 142, 203), which eventually brought him into conflict with Autophradates (q.v. ), satrap of Sparda. There was also civil war within his own family (e.g., Xenophon, Cyropaedia 8.8.4); Artaxerxes II installed his grandson, Ariobarzanes’ younger half-brother Artabazus, in Dascylium; Ariobarzanes himself was sent to Susa and executed (Weiskopf, 1989). Artabazus was satrap from about 363 into the 350s (Table 4). Although poorly documented, the events of his reign reveal a pattern of continued instability (Demosthenes, 23.154 ff., scholia to 4.19, 3.31; Diodorus, 16.22, 34; Jacoby, Fragmente 105, frag. 4). He had married a Rhodian woman in the 360s, and her brothers Mentor and Memnon became important allies (Demosthenes, 23.154 ff. ; Diodorus, 16.52). At some time in the 350s Artabazus, Memnon, and their families had to flee to Macedonia (Diodorus, 16.52.3-4; Athenaeus, 6.256c-e; Curtius Rufus, 5.9.1, 6.5.2). The degree of their influence there is uncertain. Arsites, who may have been one of Ariobarzanes’ three sons, succeeded Artabazus as satrap of Dascylium in the 350s and reigned until 334 B.C.E. He was the last Achaemenid satrap of Dascylium (Demosthenes, 23.202). As early as 338 he had assisted Thracian Perinthus against the forces of Philip of Macedon (Pausanias, 1.29; cf. Diodorus, 16.75; Arrian, Anabasis 2.12). During his reign Artabazus’ family was rehabilitated, in 343/2 B.C.E. (Diodorus, 16.42 ff.). Artabazus himself seems to have settled in the eastern part of the empire, remaining loyal to Darius III (336-31 B.C.E. ), eventually surrendering with his sons to the forces of Alexander of Macedon (q.v.) at Hyrcania in 330 (Arrian, Anabasis 3.21.4, 3.23.7; Curtius Rufus, 5.8 ff., 6.5.1-5); he fought for Alexander until 329 and was named satrap of Bactria (q.v. ; Arrian, Anabasis 3.28.2; Curtius Rufus, 7.3.2, 7.4.33-40). Mentor regained his property in Dascylium and took up a command policing trouble spots in western Anatolia; both estates and command later passed to his brother Memnon (Arrian, Anabasis 1.17; Polyaenus, 4.3.15, 5.44.5; Diodorus, 16.50, 16.52, 17.7). Arsites and Memnon fought at Granicus in 334, and Arsites committed suicide after the Persian defeat (Arrian, Anabasis 1.16-17). Memnon then led the Achaemenid counterattack but died suddenly in 333, and his nephews Pharnabazus and Thymondas took over his command. Thymondas died in Egypt in the same year (Arrian, Anabasis 1.20.2-3, 2.1-2, 2.13, 3.2). Pharnabazus was captured at Cos but escaped; he was still serving near Dascylium in 322, as a cavalry commander in the army of the Greek Eumenes, his brother-in-law (Plutarch, Eumenes 7; cf. Briant, 1985, p. 184). Macedonians then ruled Dascylium. The first was Calas, who later carried out traditional policing actions against the Bithynians (Arrian, Anabasis 1.17; Memnon, in Jacoby, Fragmente 434, frag. 12.4). The financial structure of the satrapy remained the same, but taxes were paid to the Macedonians. Some time before 323 Calas was succeeded by Demarchus (Arrian, Events after Alexander 6), and thereafter the satraps were appointed and deposed by Macedonian dynasties. The fates of Achaemenid officials and the overall survival of Persians in Hellenistic Dascylium are more difficult topics to investigate. One group of lesser officers from a cadet branch of the house of Pharnaces produced the dynasty that ruled Pontic Cappadocia (q.v.) after 302 (Diodorus, 16.90.2, 19.40.2, 20.111.4). E. Akurgal, “Recherches faites aà Cyzique et aà Ergili,” Anatolia 1, 1956, pp. 15-24. T. Bakér, Höyük 1, 1988, pp. 75-84. K. Balkan, “Inscribed Bullae from Daskyleion-Ergili,” Anatolia 4, 1959, pp. 123-28 (cf. D. Kaptan-Bayburtluog¡lu, in Epigraphica Anatolica 16, 1990, pp. 15-27). R. A. Billows, Antigonos the One-Eyed and the Creation of the Hellenistic State, Berkeley, Calif., 1990. K. Bittel, “Zur Lage von Daskyleion,” Archä-ologischer Anz., 1953, cols. 1-15. P. Briant, Rois, tributs et paysans, Annales Litteraires de l’Universite‚ de Besançon 269, Paris, 1982. Idem, “Les iraniens d’Asie Mineure apreàs la chute de l’empire ache‚me‚nide,” Dialogues d’histoire ancienne II, 1985, pp. 167-95 (esp. pp. 181-85). I. A. F. Bruce, An Historical Commentary on the “Hellenica Oxy-rhynchia,“ Cambridge, 1967. A. R. Burn, “Persia and the Greeks,” Camb. Hist. Iran II, pp. 292-391. Idem, “The Rise of the Achaemenids and the Establishment of Their Empire,” Camb. Hist. Iran II, pp. 200-91. M. A. Dandamayev, Iranians in Achaemenid Babylonia, Costa Mesa, Calif., 1992. A. W. Gomme, A. Andrewes, and K. J. Dover, A Historical Commentary on Thucydides V. Book VIII, Oxford, 1981. W. Heckel, The Marshals of Alexander’s Empire, London, 1992. S. W. Hirsch, The Friendship of the Barbarians, Hanover, N.H., 1985. G. M. A. Hoffmann, From Croesus to Constantine, Ann Arbor, Mich., 1975. J. Hofstetter, Die Griechen in Persien. Prosopographie der Griechen im persischen Reich vor Alexander, AMI, Ergänzungsband 5, Berlin, 1978. S. Hornblower, Mausolus, Oxford, 1982. W. Judeich, Kleinasiatische Studien, Marburg, 1892. D. M. Lewis, Sparta and Persia, Cincinnati Classical Studies, N.S. 1, Leiden, 1977. M. Mellink, “Anatolia,” in CAH2 IV, pp. 211-33. Idem, “Archaeology in Anatolia,” AJA 94, 1990, p. 150; 95, 1991, p. 151; 96, 1992, p. 148. R. Schmitt, “Die achämenidische Satrapie tayaiy drayahyâ,” Historia 21, 1972, pp. 522-27. Idem, “Achae-menidisches bei Thucydides,” in H. Koch and D. N. MacKenzie, eds., Kunst, Kultur und Geschichte der Achä-menidenzeit und ihr Fortleben, AMI, Ergänzungsband 10, Berlin, 1983, pp. 69-86. R. Sealey, Demosthenes and His Time. A Study in Defeat, Oxford, 1993. N. Sekunda, “Persian Settlement in Hellespontine Phrygia,” in A. Kuhrt and H. Sancisi-Weerdenburg, eds., Achaemenid History III. Method and Theory, Leiden, 1988, pp. 175-96. C. G. Starr, “Greeks and Persians in the Fourth Century B.C.,” Iranica Antiqua 11, 1975, pp. 39-99; 12, 1977, pp. 49-115. C. Tuplin, “The Administration of the Achaemenid Empire,” in I. Carradice, ed., Coinage and Administration in the Athenian and Persian Empires, BAR 343, Oxford, 1987, pp. 109-66. G. Walser, Hellas und Iran, Erträge der Forschung 209, Darmstadt, 1984. M. Weiskopf, “Achaemenid Systems of Governing in Anatolia,” Ph.D. diss., University of California, Berkeley, 1982. Idem, The So-Called “Great Satraps’ Revolt,” 366-360 B.C., Historia Einzelschriften 63, Stuttgart, 1989.